With a media landscape that continues to change at a rapid pace, experts like Mary Meeker of Kleiner Perkins Caufield & Byers (KPCB) are constantly checking in on how tech is evolving and what it means. TechCrunch says that Meeker has essentially become a legend for publishing her annual Internet Trends Report on all things digital. As InkHouse’s Beth Monaghan wrote in her overview of last year year’s report, Meeker’s take on these trends offers a ton of insights to those in media and PR. Since the report is a made up of a whopping 213 slides, we’ve made it easy for you. Here are some of the key insights that PR professionals should know from this year’s report. Visual media continue to dominate. Meeker points out that the social networks that lead in terms of engagement are all visual by nature. What’s more, platforms like Snapchat and Facebook Live have taken advantage of the exploding video space, and speak to a larger shift among users – while Millennials typically communicate with text, Generation Z prefer to communicate with images. In his reflection on the report, R/GA’s associate director of connections planning, Mickey Goldstein, points out that according to Meeker, Snapchat has more monthly users per visitor than any other platform besides Facebook (the site recently surpassed Twitter in daily usage). Understanding this shift presents a huge opportunity for marketers looking to reach both generations. There’s an opportunity to reach users by creating innovative, eye-catching and creative content. At the same time, marketers should keep in mind that that it’s not enough to create content and upload it to a social platform because the stream as we know it is dying. 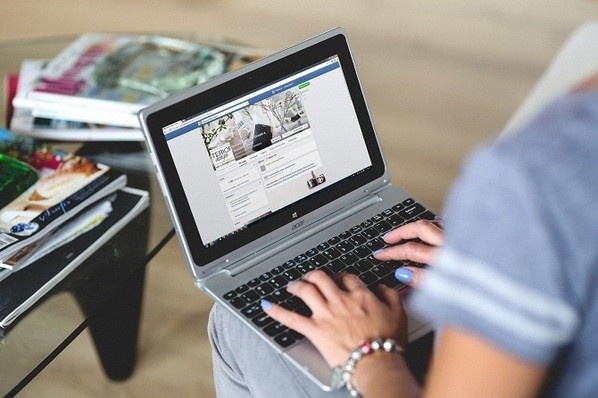 With a record number of posts and information being shared online, this “unfiltered informational cascade” is undergoing a massive change as platforms and media organizations seek to curate content to optimize it for the individual. By creating content that is authentic and entertaining, brands have a better chance at getting into the stream – meeting their audience where they are and compelling them to watch. If you need any more proof that images are driving engagement and present real value, consider the level of engagement on OfferUp, a platform where users can buy and sell goods. 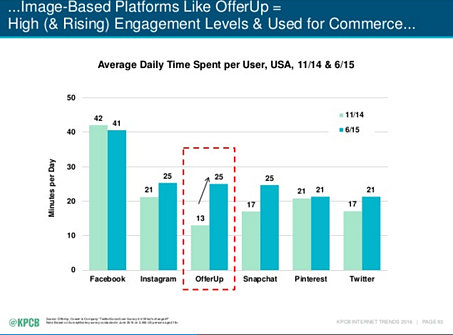 OfferUp users spend the same amount of average daily time on the app per day as do users of Instagram and Snapchat (25 minutes per day). Just a few years ago being able to watch a friend’s Snapchat story was changing the way we received and viewed video. 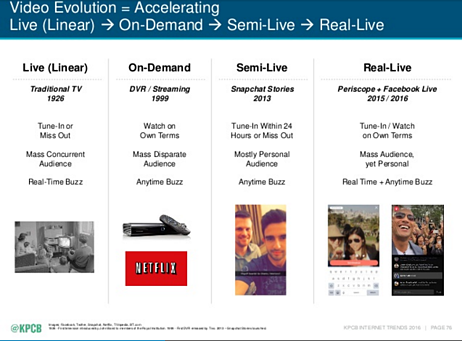 This semi-live experience was part of the ongoing evolution of video content. Now, the audience has become more personal; individuals and brands can also garner a mass audience more easily on these platforms – think Periscope or Facebook Live. This paradigm shift in broadcasting is a result of how viewers are hungry for “real-live” content. 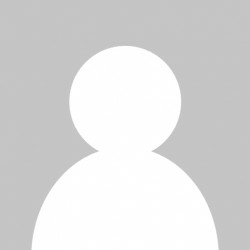 What guidelines can marketers follow when it come to getting in front of their audience? Meeker says that Snapchat has it figured out and breaks down the “3 Vs” of content: Vertical (essentially, this is made for mobile devices), Video-based (it’s the best way to tell a story that reaches people), and Viewing (people are always viewing content in full-screen). If you're about to try out live video streaming for the first time, check out our list of tips for marketers using Periscope for best practices. Mary Meeker’s macro look at global trends reveals that the way we communicate is strongly tied to our generational preferences. She emphasizes that there is a huge opportunity here to reach Millennials and Generation Z, and breaks down exactly how attitudes toward media and lifestyle has changed from generation to generation. You can dig into the report for more on Millennials and Gen Z, the rise of voice interfaces, internet trends in China and more. Ferris Bueller got it right when he said "Life moves pretty fast. If you don't stop and look around once in a while, you could miss it." Okay, so Ferris Bueller is a fictional character who said this in 1986 when the internet as we know it today was non-existent, but this holds true for technology and the way we consume media and content. Luckily, Mary Meeker is keeping tabs on what's changing and what it all means for the future. We're already looking forward to next year's report!